Wardell Julius Clark was the Assistant Director for Court’s productions of Gem of the Ocean and Satchmo at the Waldorf. Directing credits include Insurrection: Holding History (Stage Left Theatre); Surely Goodness and Mercy (Redtwist Theatre); The One Minute Play Festival; and Shola’s Game (Black Lives, Black Words Chicago 2). Acting credits include: A Raisin in the Sun (TimeLine Theatre); The Whipping Man (Northlight Theatre); We are Proud to Present… and The Gospel According to James (Victory Gardens Theatre); Invisible Man (Court Theatre); The Beats (16th Street Theater); Ghosts of Atwood (MPAACT), for which he received the Black Theater Alliance Denzel Washington Award for Most Promising Actor; and Topdog/Underdog (American Theater Company/Congo Square Theatre). 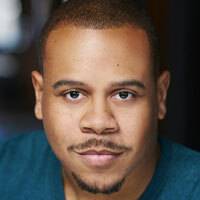 Regional credits include The Whipping Man (Cardinal Stage); Cymbeline (Notre Dame Shakespeare Festival); Fences (Carver Theatre); and Big River, Much Ado About Nothing, You’re a Good Man Charlie Brown, The Who’s Tommy, and A Chorus Line (Virginia Samford Theatre). TV/Film: Chicago Fire Seasons 1 and 4 and Transformers: Dark of the Moon. Wardell is an Associate Artist with TimeLine Theatre Company, where he also serves as a Teaching Artist in the Living History Program. He is also an Associate Artist with the Black Lives, Black Words theatre collective. He holds a BFA in Acting from The Theatre School, at DePaul University.